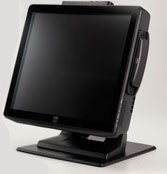 The ELO B2 Cool and Quiet All-in-One touchcomputer platform simply provides more flexibility with a choice of configuration and connectivity options, more serviceability with easy access to key components, and more processing power, all in a compact design. In addition, a wide array field-installable peripherals, spill-resistant sealing, and a selection of input/output port connection options make the B2 Cool and Quiet both versatile and powerful. It is designed with the future in mind, allowing easy field serviceability of all of the main components. The "Cool and Quiet" B2 features a fanless Intel Atom Dual-Core 1.66 GHz processor. The Elo E706670 is also known as Elo Touch Systems	ELO-E706670	.